Steve Stowell started his college career at UCLA as a hitter. He ended it as a pitcher. The end of his college career also saw him get drafted, as a pitcher. In February 1987, as UCLA began its season, Stowell was projected to be the Bruins' third starter. His coach Gary Adams also told The Los Angeles Times Stowell's work impressive. As a pro, Stowell turned that impressive college work into a total of six seasons. He ended up making AA in three of those, but he never made it higher. Stowell's pro career began that year in 1987, taken by the Twins in the 14th round of the draft, out of UCLA. In early April 1987, Stowell pitched himself onto a mid-season All-Tournament team and won tournament MVP. With the Twins, Stowell played his first season between rookie Elizabethton and single-A Kenosha. He went 3-4 between them, over 12 outings, 10 starts. He returned to Kenosha for all of 1988, turning mostly to relieving. He got into 41 games, 12 starts, with an overall ERA of 5.00. That year Stowell was also mentioned by The Chicago Tribune in a minor league pranks story, with Stowell and two other Kenosha pitchers playing good-natured pranks on their host family. For 1989, it was single-A Visalia. In 58 relief appearances, Stowell had an ERA of 3.84. He also picked up six saves. 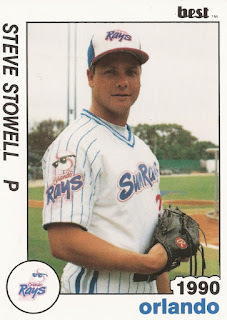 Stowell debuted at AA Orlando for 1990, playing that year and the next there. In July 1990, Stowell struck out Columbus' Luis Gonzalez to end a game. That August, Stowell picked up a relief win, getting two eighth-inning outs. In 1991, he also contributed to an Orlando stretch drive. In his first season at Orlando, Stowell posted a 4.39 ERA. In his second, he bettered that to a 2.70 mark. But that second year at Orlando was his last with the Twins. He played one more year in the White Sox system, with 21 outings at AA Birmingham, ending his career.